If you need a new personal assistant at your company, use this personal assistant job description to hire an employee based on education and experience. Answer phones and schedule appointments for employer. Run errands, such as picking up dry cleaning and getting coffee, when necessary. 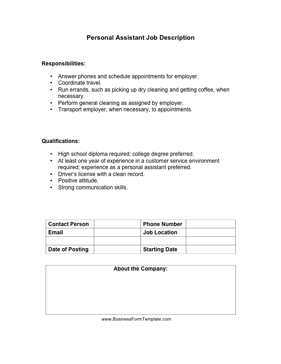 Perform general cleaning as assigned by employer. Transport employer, when necessary, to appointments. At least one year of experience in a customer service environment required; experience as a personal assistant preferred.